Oh well, K-craze has been really hot recently. And probably loads of girls and guy might wana follow the trend too? Wanna look like a korean star with the least powder? Receive my tube of bb cream from THESAMPLESTORE.I tried it with doubt, and now....i use it without DOUBTS. I just love my look now without all my fake lash and eyeliner..
Just bb cream and loose powder. Highly coverage and more matte look. 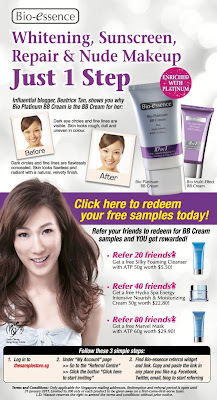 8 IN 1 bio essence bb cream is your current favourite? How bout 10 IN 1?? This Platinum bb cream contain a rare metal that helps to revitalise and aids in whitening.. Contain SPF25/PA++, sunblock level not too high, so doesn't clog your pores badly. Don't believe what you see in my blog? Come try them to prove me wrong then.